The Kartis Visible Bill Change is one of the most ingenious and visible methods to turn a blank piece of paper into a bill that you will ever see. Imagine you show both sides of a blank piece of paper held dangling down from your finger tips. Only one hand is used. The paper visibly, with no cover, changes to a bill which is immediately shown on both sides. If you could do real magic it would look exactly like the Kartis Visible Bill Change. 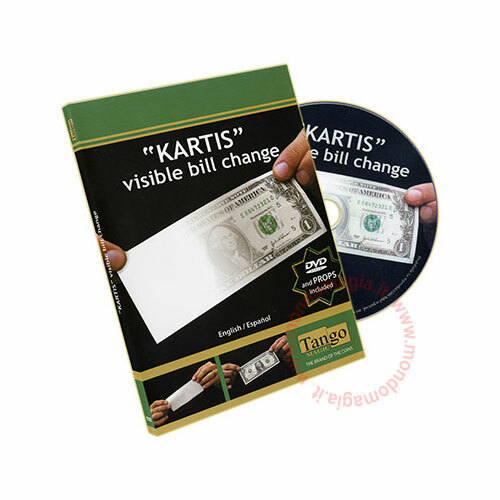 The Kartis Visible Bill Change is an effect you will always carry with you and use. - You receive a detailed DVD and the gimmicks to perform the effect. - Truly one of the most visible and stunning bill changes you will ever see.